With the Childbloom approach to lessons, your child will have fun learning the guitar. 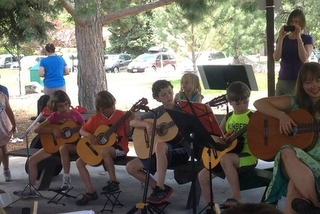 Our small group classes of two to four students gives participants the opportunity for camaraderie and ensemble interaction, while also receiving individual attention and developing solo playing skills. The curriculum and teaching techniques we use have been developed over the last 35 years specifically for working with young students, with instructors that are trained and experienced with teaching directly to each student's development level. Parents are invited to be involved in the lessons and are given tools to be able to help with the learning process at home. We have a very high student retention rate because our students are given clear, consistent and achievable goals to have successful musical experiences. 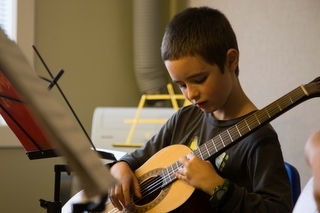 Students are taught a classical fingerstyle approach to guitar that uses both left and right hands equally, as it is a style that does not limit their ability to improve. All our instructors are well-schooled in guitar technique, and are periodically reviewed to ensure that all students are exposed to a consistently high level instruction. 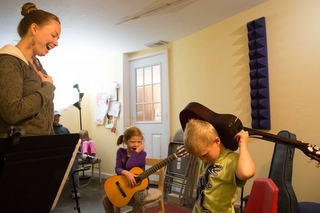 Students learn songs in a variety of music styles, with a focus on both ear training and developing music reading skills. 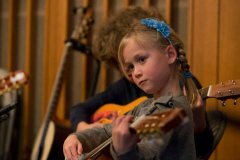 Student recitals and concert events take place several times a year, giving your child the opportunity to perform in front of enthusiastic, supportive audiences. All performances are voluntary. In addition to recitals, student performance ensemble opportunities are available for motivated students. To view our upcoming performances, see our Events section. 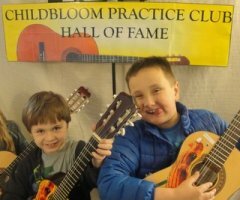 "My 9-year-old boy has been taking guitar lessons at Childbloom for 3 years now. And he loves it. His instructor has always brought out the best in the 3 high-energy boys in the group lesson. He helps them focus and learn in a really fun way. They know scores of songs now of increasing difficulty. And they play with musicality. And when any one takes the focus away (as nine-year-olds will do), the teacher has a great way of turning their distractions into fun, creative ways to make music by pulling out exotic instruments, having them play behind their back, each contributing a repetitive sound to the collective "noise machine," balancing one more stuffed animal on their heads with each successful repetition of a tricky part of the song or any number of ways that he's figured out kids respond to over the years. It's great." "Missoula Childbloom is an amazing program and I cant imagine not giving my children this experience. I am not a musician but my kids are, they learn to play at a pace they understand, they read music, they have fun and they are proud of their accomplishments. Music has opened their minds and they've learned to understand and appreciate music on a level I dont understand. I wish I would've had this opportunity as a child. Sign your children up and stick with it, it will change their lives and yours. I would highly recommend this program!"